I have been thinking about my reading of "digital public space". I like how the perspectives I bring shift as I emphasise different words within the phrase. If I read with emphasis on pairs of words I draw on different associations, for example 'Public Space' and 'Digital Public'. Public Space – I have been working recently with locative media and studies of design in public spaces like city squares and transport hubs. In my reading of architectural, built environment and marketing literature, the scope of the term 'public space' tends to shift around, ranging from publicly owned (like a public park) to publicly used (like a shopping mall) to any pedestrian space (like a private office lobby). We can apply similar possible distinctions to online public spaces. I have recently been enjoying talking about civil inattention, ownership and civic infrastructure in this context. Digital public space is also, in part with this reading, about the addition of digital to physical spaces. This includes adaptive architectural surfaces, big screens, mobile devices, and so on. In considering 'smart' architecture, we must also consider the implications for surveillance and privacy. Digital Public – For me, the study of the digital public is a study of the politics of connectivity, storage and processing. Here, I read 'public' as a reference to 'the commons'. Questions of free/libre access, net neutrality and expression come to mind. In this area I have been looking at the role designers, artists and data scientists can play as co-director of a project titled Data is Political. Digital public expression is also about systems of social interaction, including identity and performance. 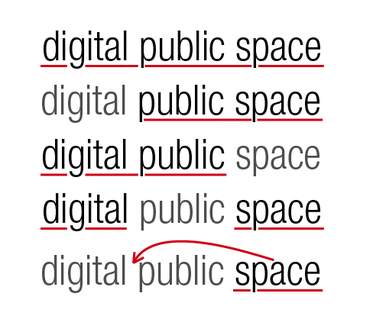 Digital/Public Space – Another reading I find is the relationship between the words. For example, we can think of the digital/public space, that is, with an emphasis on the space between the digital and the public. For me, this becomes a discussion focused on interfaces. The space between the digital and the public is a space of screen, announcements, sensors, buttons, and so on. By phrasing this as 'public' and not 'user' we have an interesting shift from 'computer human interaction' to 'computers humans interactions'. Design for a crowd or an ecosystem of interaction. We could carry on, 'Digital Space' makes me think of navigation, spatial metaphors, instant blur and infinite zoom. Taking single words: 'Space' evokes thoughts of storage, archives, memory, forgetting, limited vs infinite; 'Digital' for me is about digitisation, copying, connectivity, remapping, recursion and lowering costs; while 'Public' makes me think of doing things 'in public' in contrast with 'in private' and themes of fame and pop.